My mother is an excellent seamstress. She claims that she’s “out of practice” but she can sew on a button better than anyone I know (though she knows I’m better than her when it comes to making button holes on the sewing machine–her one weakness!) For as long as I can remember, she’s kept her sewing materials in a sewing box that I can only describe as “accordion like”. She and my dad gave me my own sewing machine as a graduation gift from college along with a cute black and white polka dotted sewing box which proceeded to literally fall apart in about two months time. 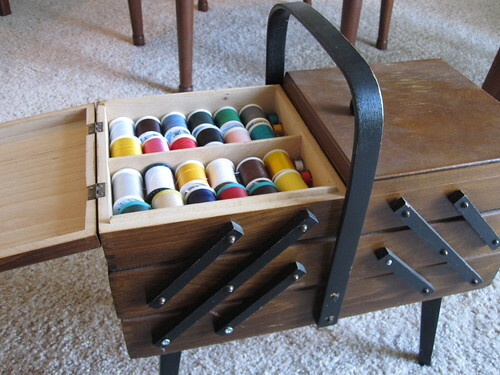 I had been on the prowl for a new sewing box for a while when I decided to check out ebay to see if I could find something similar to the amazing box my mom had always had. Behold. My Christmas present this past year. This photo shows you how the box opens. It fans out and sits about 4 feet long when it's fully opened. You’d be amazed what all I can fit in this thing. Granted sewing accessories typically aren’t too big, but I have all of my little tools and materials stuck inside. And I love that instead of it being one big box or bag that I have to dig through, there are several different compartments to hold everything oh so neatly. 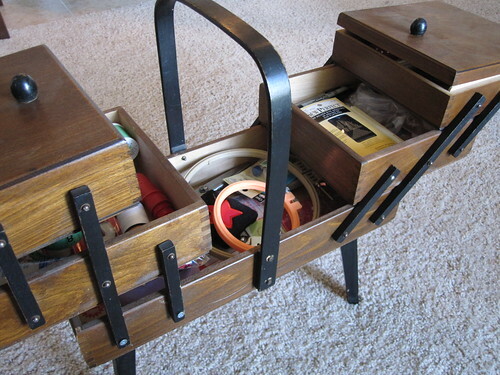 It’s like my organizational obsession was channelled into the design of a wooden box. Genius. 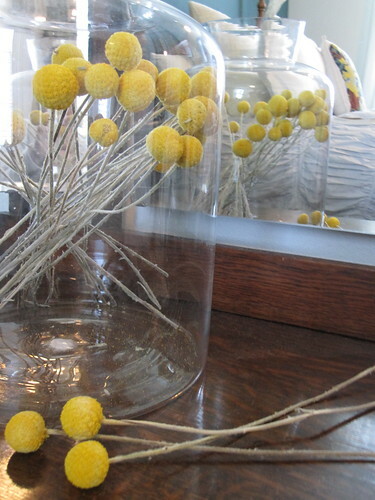 I saw these in a vase in the window of Anthropologie several months ago and fell in love. First of all, yellow is my favorite color and I just thought they were great. I took a picture of them because I had no idea what in the world they were. I went to my trusty source of all things floral (aka my friend Julia) and just like I knew she would, she knew exactly what they were just from the picture. Crazy impressive. Turns out that you can only buy them during certain months of the year–big bummer. So I found this website that I thought were pretty reasonably priced as the only place I could find them in Austin was at Central Market for $2.75 per stem. Ridiculous. I found the wonderful people of Nettleton Hollow in Brooklyn, NY (great to work with by the way) who sell 20-30 stems for $16.50. Now that’s more like it! Now I have these all over our apartment! The great thing about these though is you can buy them still alive and you have to dry them yourself–something I have no idea how to do–because when they dry they loose they’re rich yellow color. These have already been dried in a special way that makes them keep their color and they’ll last for a year or two! 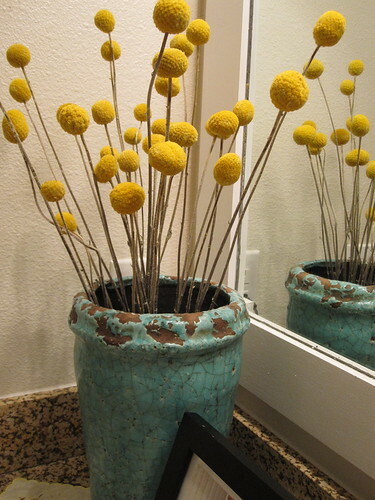 Craspedia in a vase from Anthropologie--a gift from my dear friend Tiffany. For some reason these just seem so cheery to me. Several of my friends have seen these and ordered their own from Nettleton Hollow and each of them have done the most unique things with them. Word to the wise however, cats like to play with the balls on the ends of the stems. Not sure if they’re poisonous–our cat Avey is still alive and well so hopefully we’re in the clear! The first love of my life. 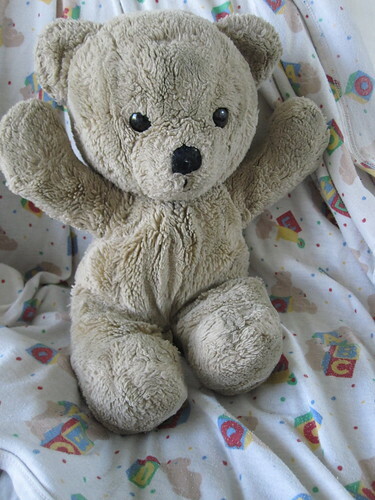 Ok, judge me if you will people, but yes one of my favorite things is my Teddy from when I was a little girl. I still have a serious attachment to this thing. I think if we were all honest with ourselves each of us would know there was a stuffed animal, doll, toy, etc. stashed away at our parents home or in the attic somewhere that once held your heart. Don’t be ashamed. Mine lives in my nightstand! I will say, I no longer sleep with him so don’t be too quick to judge me. My mom’s little sister Becky gave me this Teddy bear right after I was born. It was my favorite thing in the world growing up. He used to have a blue bow or necktie or something of the sort around his neck but that is long gone (and yes, it was blue. The doctors told my parents that I was a boy). 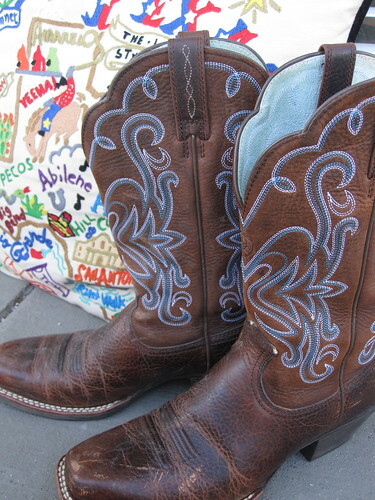 Every true Texan has to have a good pair of cowboy (or cowgirl) boots right? I will proudly say that yes, I am one of those people that is probably a little too proud of my home state. Honestly though, who wouldn’t love a place where people dress the way they do here? You just have to laugh at it and appreciate the cowboys for who they are. And I will sadly say, you don’t see as many of them as you’d expect to. I wish I had the guts to dress that way, though I don’t think boots and Wranglers count as “business formal” attire for work. Ha! Thus, number 7 on my list is my trusty pair of boots. These my dad bought me in high school. They’re a little more ‘cutesy’ with their teal threading, and definitely not as broken in as I’d like, but they suffice considering I cannot find my favorite pair of all time. That’s another story that’s too sad to discuss. Who wouldn't want cowboy boot house slippers? I know that I have already posted about our Berkley illustrations, however I can honestly say that these are some of my favorite things that Mr. Fancy Pants and I have purchased together since we have been married. I think if you know both of us it is pretty clear that we typically don’t share the same taste in a lot of things, art included. I attribute that to a lot of things: his love for design, my lack of knowledge about design, his love for any color that would belong in a box of neon Crayola markers, my dislike for those colors and love for the box of bold Crayola markers, his strange fascination with triangles, wolves, Native American inspired artwork, and the like, my thinking wolves are weird…I could keep going for days. 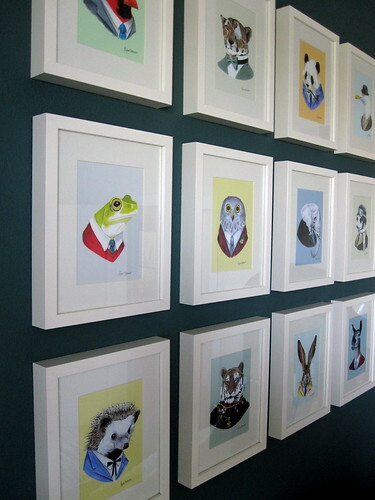 These prints however, are loved by both of us. He loves the humor in the characters. I love the sophistication and color palette. I imagine few piece of artwork we own in our lifetime will ever hold as much as excitement as the anticipation of these arriving on our doorstep. The pictures don’t do them justice. 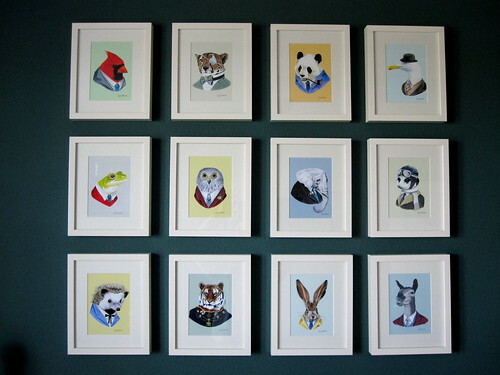 Right now they hang above our bed but I’d love to have them in a dining room one day with some modern dining room furniture. Can’t wait. 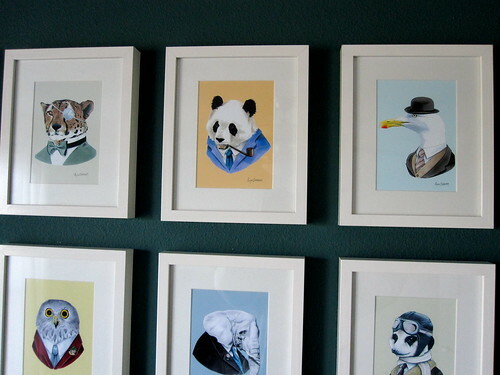 I would encourage you to check out these talented artist’s work. They are prints of the originals, however I cannot describe to you how detailed and beautiful these are up close. So much so that I was hesitant to frame them because while it shows them off, it almost takes away from them. Seriously, check out their work. Taking a break from the Christmas decorating–don’t worry those posts are returning soon–I’m really excited to share about mine and Mr. Fancy Pants’ new decorations for our bedroom. We got the most awesome bedding from my aunt and uncle for our wedding and Christmas gift last year from Anthropologie. I absolutely loved it. Sadly, it began falling apart on us. All of the seams were breaking and coming apart, and I can say that honestly only one of the holes in the comforter was our cat Avey’s fault!